As I wrote my goals update post last week, I realized that though I’d long ago come up with a solution to my spice situation (item #14 on my list of goals for 2014) and I had promised Stacy that I would blog about it, I have been delinquent in actually writing said blog posting. But better late than never, right? 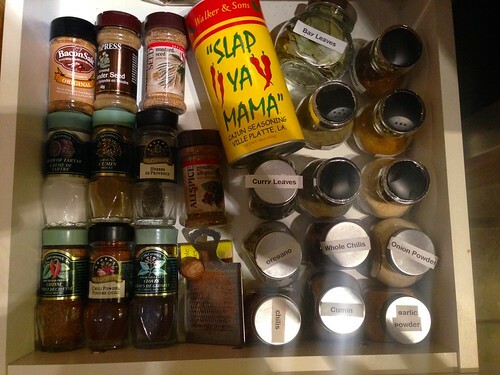 To give you a little background, I own about eleventy billion types of spices because spices are awesome. What was not awesome was that I had spices in all sorts of different containers – some were in bags, some in jars/bottles – of all different sizes and I basically just had them all thrown haphazardly into plastic bins that I kept in my cupboard, which meant that whenever I wanted a certain spice, I had to pull all the plastic bins out of the cupboards and dig through them all to find what I wanted. Not very efficient and rather annoying when you are trying to enjoy some cooking! 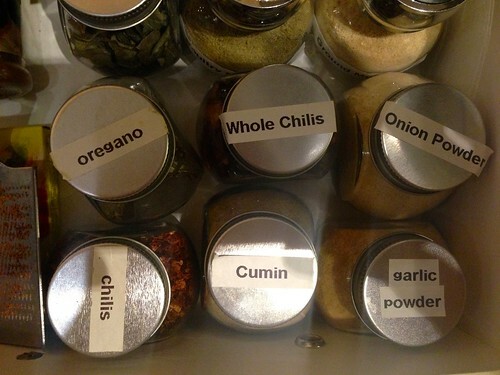 Hence, why I decided I needed to figure out a useful way of organizing the damn spices. My first step was taken care of, as I long ago had made a test tube spice rack out of surplus lab equipment1. 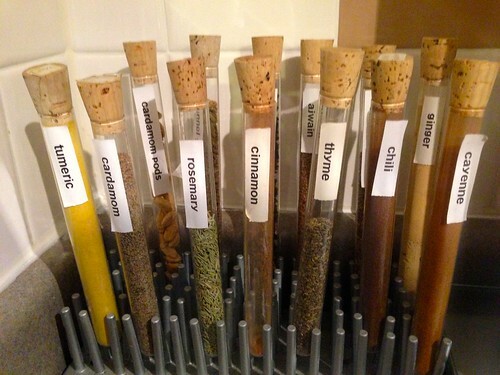 I don’t have enough room for all elevently billion spices, but I was able to put the 13 spices I use the most often (or which just look really cool) into test tubes, labelled them, and now they sit on the counter, within easy reach while I’m cooking. The metal thing on the right is a grater that I use to grate nutmeg. Because my sister taught me the joy of freshly ground nutmeg. I have no idea why I inconsistently capitalized the spice names on the labels. I only just noticed it when I looked at this photo. Omg, that’s going to drive me crazy. 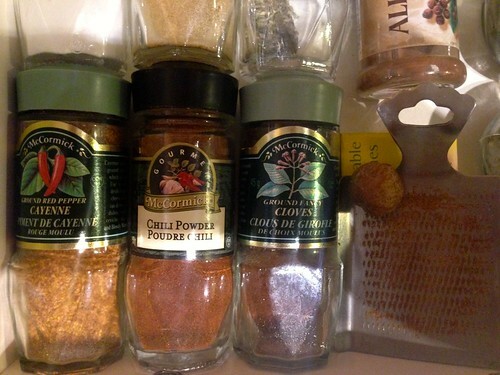 So there you have it – my spice storage solution! I LOVE the test tubes! That is so awesome. And it’s the same here: have a ton of spices, use the same 10 almost all the time and the rest just sit there until I need them once a year. I need more drawer space! Thank you for posting!